Indonesia is punishing more than 20 companies in an unprecedented move for starting deadly forest fires that killed 19 people, a government official said Tuesday. The companies - most of them pulp wood plantations operating on concession land in Sumatra and Kalimantan - have had their business licences suspended. The firms include BMH and SWI, which have concessions in South Sumatra. BMH is a supplier to Asia Pulp & Paper (APP) in Indonesia. BMH, SWI and APP have the same parent company, the Sinar Mas Group. The suspensions would be lifted if, within the next two years, the companies show that they have made significant progress in efforts to prevent future fires. Several other companies have been given a strong warning and will be put under close supervision. "We have sanctioned 23 companies in total, ranging from administrative sanctions to license revocation, while 33 others are still in the process, they could have their licenses revoked too if they are found guilty," environment ministry official Kemal Amas. "We need firmer law enforcement so that this catastrophe does not repeat itself, it’s been going on for 18 years but nobody has learnt their lesson," Amas said. Activists welcomed the government’s new commitment to punish firms. The Indonesian Forum for Environment (Walhi) said it was unheard of for the government to revoke licences, as many companies previously avoided facing trial. "The minister has the courage to not only freeze the companies' operation but also chase the owners in a civil case, this is great and this must be guarded carefully," Kurniawan told. "In the past some people were named suspects, but for them to actually lose their licenses, this is the first time," he said. 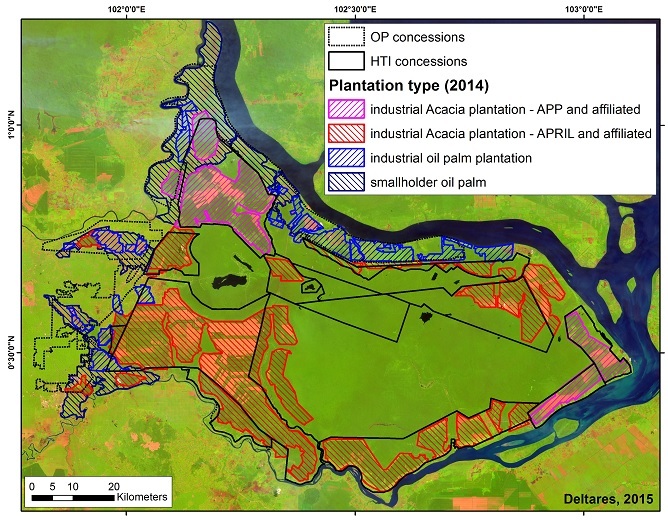 A new Deltares report, commissioned by Wetlands International, reconfirms that pulp wood and oil palm plantations in peatlands cannot be managed sustainably. Such drained plantations will inevitably suffer from severe land subsidence, increasing flooding and eventually production loss. 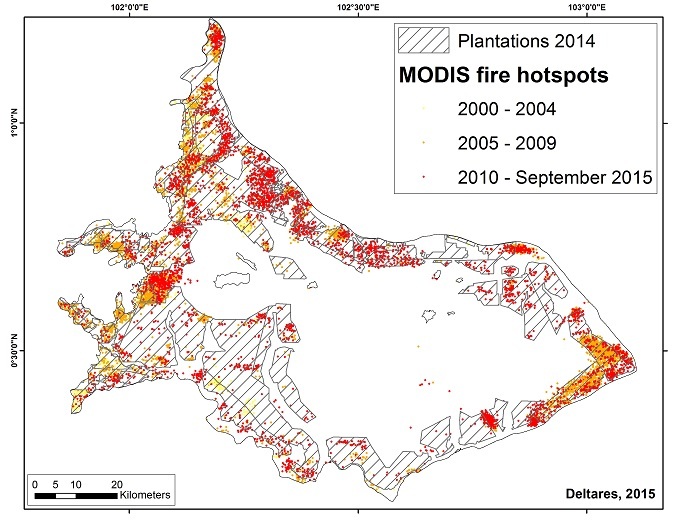 The report also provides evidence that fires only occurred in drained peatlands and therefore inside or near plantations. Greenomics report title is “APP Milestones?” quoting the milestones released by EPN in September 2013: "APP's Peatland Management Milestones and Peatland Best Practice Management programs must now be called into question” says the report. The Greenomics document criticize APP for starting to re-wet peat areas. "The massive extent of the burned-out peatland on the largest APP-linked concession clearly demonstrates the company’s inability to comply with its legal obligation to prevent or control forest and land fires on its concessions”, concludes Greenomics, adding that for this is the reason the Ministry of Environment and Forestry decide to freeze the BMH concession license.